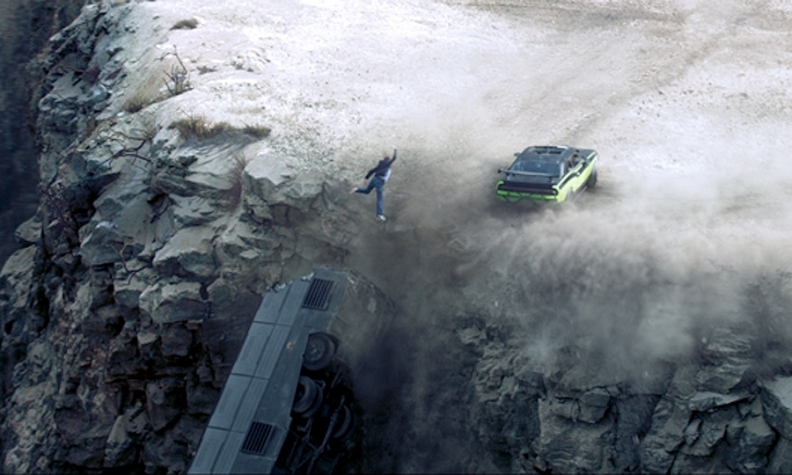 A scene from the next installment of the Fast & Furious movie franchise. Dodge is continuing its partnership with the high-octane “Fast and Furious” movie franchise with the upcoming Furious 7. Dodge’s marketing effort will feature TV spots, music videos and a special website providing movie photos and details about several variants of the Challenger and Charger, including the SRT Hellcats. Dodge introduced a promotional spot for the film nationally on Monday titled “Flash to the Future.” The ad shows a customer in a Dodge dealership getting caught up in a high-speed fantasy that previews a scene in the movie. Dodge’s U.S. sales, hurt by the loss of the Avenger, slipped 3.7 percent last year and dropped 8.5 percent this year through February. The automaker also will run spots in the Middle East, showcasing the 2015 Charger, and in other international markets, which will highlight the 2015 Wrangler. The spots were made in partnership with ad agency Doner. A new twist for Dodge this year is its alliance with record company Atlantic Records, which is releasing the movie’s soundtrack on March 17. In this exclusive deal, current and throwback Dodge models will strut their stuff in the soundtrack’s music videos. “Fast Dodge cars, adrenaline-filled action and heart-pounding music have fueled the Fast & Furious movie franchise,” said Olivier Francois, Fiat Chrysler’s chief marketing officer, in a statement. The Dodge lineup will be well-represented in Furious 7, which hits theaters April 3. A cherry red 2015 Charger, a “sublime” green and black Challenger R/T, and an armored 2015 Jeep Wrangler Unlimited will “play prominent roles” in the film, Dodge says. The movie stars Vin Diesel, Dwayne “The Rock” Johnson and the late Paul Walker.